Add, delete and change the placement order of operation buttons that are displayed on screens. 1) Click [Settings] on the menu bar, and click [User Settings]. 2) Click the [User Interface] tree, and click [Button]. 3) Select the area to customize from the list. 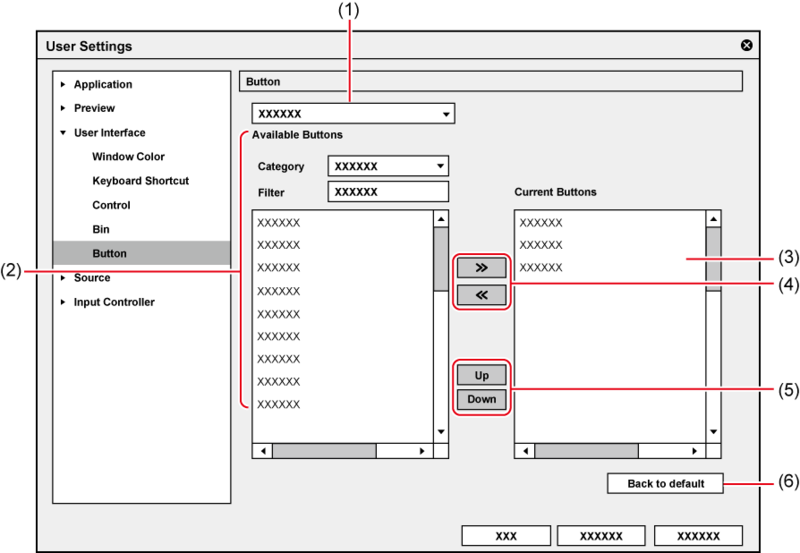 4) From the [Current Buttons] list, select the button one position below the insert position. 5) Select the button to add from the [Available Buttons] list, and click [>>]. The selected button is added to the [Current Buttons] list. When [Space] has been added, a space is added between the two buttons. To delete a button, select the button to delete from the [Current Buttons] list and click [<<]. When [Space] has been deleted, the space between the two buttons is deleted. To change the position of a button, select the button to move from the [Current Buttons] list and click [Up] or [Down]. Each click of these buttons moves the selected button one place up or down. To add a button, select the button one place under the insertion position in the [Current Buttons] list, and double-click the button to add from the [Available Buttons] list. To add a button, drag and drop the button to add from the [Available Buttons] list onto the [Current Buttons] list. To delete a button, double-click the button to delete from the [Current Buttons] list. To delete a button, drag and drop the button to delete from the [Current Buttons] list onto the [Available Buttons] list. To change the position of a button, drag and drop the button in the [Current Buttons] list. If too many buttons are added to the center area of the Player and Recorder, only the buttons that can be shown within the area are displayed from the top of the list. During file operations, area settings can be customized by [Player - File (Area)], and during deck operations, area settings can be customized by [Player - Deck (Area)], respectively. Areas A to D are the same for the Recorder, too. Select a category to narrow down [Available Buttons]. Enter a keyword to narrow down [Available Buttons]. Displays the buttons to display. Add/delete buttons to be displayed. Change the position of buttons.